From the Preface:The title for this collection was the title of a course in literary criticism that I gave for many years at Bennington College. And much of the material presented here was used in that course. The title should serve well to convey the gist of these various pieces. For all of them are explicitly concerned with the attempt to define and track down the implications of the term "symbolic action," and to show how the marvels of literature and language look when considered form that point of view. 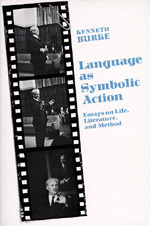 Kenneth Burke was a self-taught thinker who attempted to integrate scientific and philosophical concepts with his analysis of semantics and literature. Between 1927 and 1929, Burke worked for the "Dial "as a music critic. After a brief stint with "The Nation "(1934-36), he turned to literary criticism and taught at Bennington College from 1943 to 1961. His many works have all been published by the University of California Press.